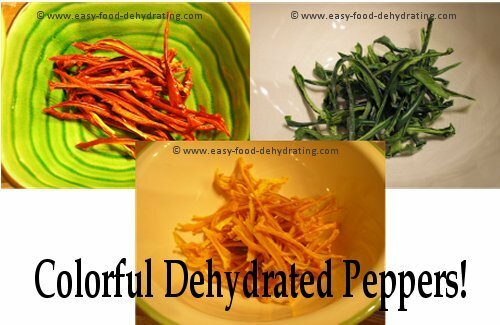 Dehydrating Peppers takes a few easy steps and are great for use in stir-fries, and omelets, just to name a few dishes! Frozen varieties can be used too! 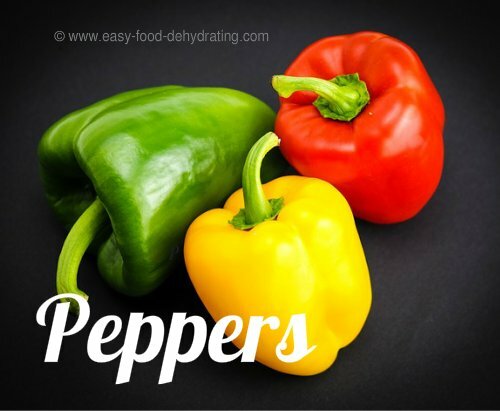 Peppers are not only colorful, they are a fantastic source of vitamin A – with the red variety being #1. The vitamin C leaders are the 'yellows'! The champion Folate pepper is the red pepper! All three contain trace amounts of Niacin, vitamin B6, and Pantothenic Acid. Minerals found in all three types are: a good source of Potassium, followed by Phosphorus, Magnesium, and Calcium. There are trace amounts of Iron, Zinc, Manganese, and Copper. Selenium can be found in the red and yellow peppers, and Fluoride only in the green pepper! Green and red, but not yellow Peppers, contain Omega-3 and Omega-6 fatty acids. For more on peppers and their nutrition, I went to WebMD and discovered this. Fill YOUR Kitchen with a Mediterranean Aroma! 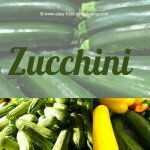 Try this fantastic dish which consists of onions, peppers, zucchini and squash. 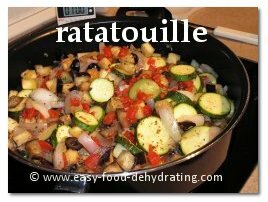 It's known as ratatouille ... this dish will fill your kitchen with fantastic aromas of the Mediterranean! Try slicing your peppers in different ways: in rings, "fat" slices, or thin slices ... and diced! If using the frozen variety, ignore step 1. Remove the stem and seeds and slice into 1/4" strips. 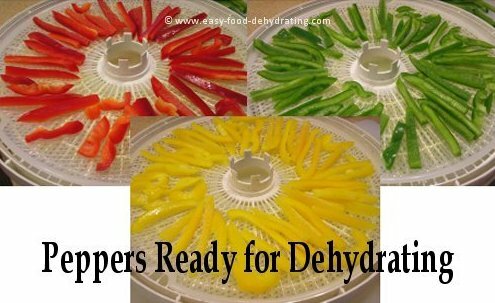 Arrange the slices on your food dehydrator trays, making sure they don't overlap. When fully dehydrated, they will be leathery. It's a lot of fun dehydrating peppers and getting them all chopped up in 'one go' saves prep time later on. In my side-by-side photos (below) you'll see that I have made three separate bags with a combination of yellow, green, and red peppers – perfect for a stir-fry or omelet! Simply re-hydrate! They were originally store-bought three-to-a-pack, and that photo shows nine peppers total, so you can see how much room you can save by dehydrating them! The blue packet which is a 100cc oxygen pack, in the photo at right, below, shows one vacuum-packed bag! Click on the following links to find out more about oxygen absorbers and their important role in food dehydrating and safe storage, and how to vacuum-seal your dehydrated vegetables for long-term storage.